Tonight CSP & Papa went to see the Carolina Panthers play the Minnesota Vikings here in Charlotte. CSP was SO excited! 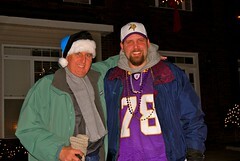 It was his first time seeing his beloved Vikings in 20 years, since he lived in Minnesota where he was born. My boys were so cute all done up in their respective team gear. CSP, my conservative CSP who won’t even wear stripes, donned purple and gold Mardi Gras beads to support his VIkings! It was soooo cold so they had on tons of layers and Papa had his Panthers Santa hat. We drove down to Papa & Gigi’s house and picked them up then headed back uptown to drop the boys off for the game. There were people EVERYWHERE! We were excited to see some Vikings fans amongst the Panther fans. We even saw some horned helmets! The people were all over the streets and there wasn’t a really good place to drop them off. So I just pulled over on the side of the road in the opening of a parking lot. CSP jumped right out, gave me a goodbye kiss through the window then got out of the street. Meanwhile, Papa had the back door open and was getting dressed! He hadn’t put on his pullover or jacket yet. Gigi had her window down and we were yelling out to the boys. Things like “Have Fun!” etc. I was about to yell something when Gigi yelled “BE HEIFER!” What??? Be heifer? WTH does that mean? She was trying to say Behave and Be careful but it came out Be Heifer! We dissolved in giggles and pulled away. We were laughing so hard we ended up getting all turned around amidst all the one way streets and it took over 30 minutes to get back to the highway! Too bad CSP’s forward fashion statement didn’t help the Vikes. We went to Miinesota to see the Vikings last month. I swear walking through the city was like walking through a sea of purple and gold!! I’ve never seen anything like it!